Originally called The Tennor Twins, the duo of George â€œCliveâ€ Murphy and Maurice â€œProfessorâ€ Johnson, recorded first for Coxsone Dodd at Studio One. They are said to have auditioned for Dodd’s arranger Jackie Mittoo in the back of a cab to land their recording deal. As a result, they had the biggest hit of 1967 with the semi-rude ‘Pressure & Slide’, whose rhythm track would be recycled numerous times over the next 10 years. 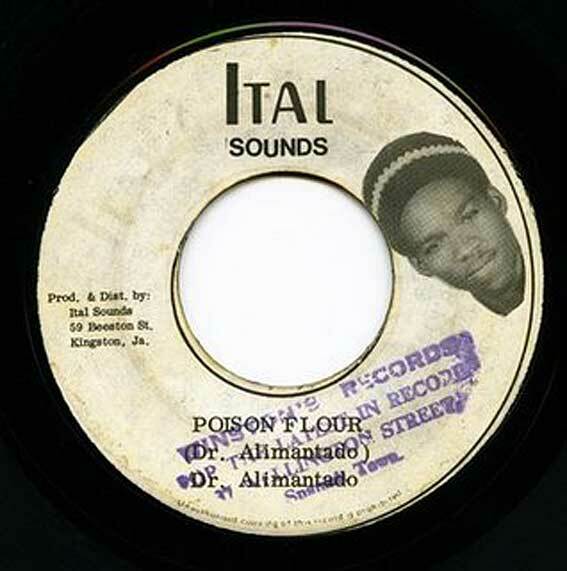 It was used for Prince Buster’s ‘Orange Street’, and Alton Ellis’ ‘Aint That Loving You’, as well as the Lee Perry track ‘Musical Doctor’ from his 1992 album recorded at Studio One. 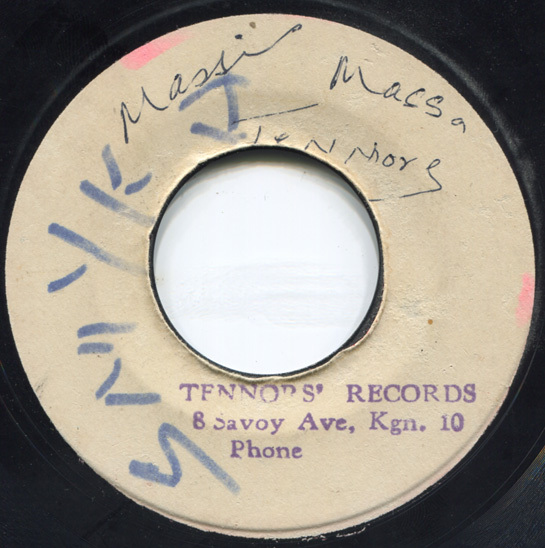 The Tennors went on to have further rude hits thru the 60′s with ‘Ride Mi Donkey’, and ‘Rub Mi Khaki’, as well as this gem, ‘Massi Massa’. The story of country girls who move to town thinking they are going to become queens of society, only to find themselves homeless and miserable having had no idea that life could be so tuff. “Massi massa, massa me bwoy, I wonder why the time is so hard…” Something many of us can identify with these days. Despite the rude slackness of their early releases, The Tennors went on to become a Christian reggae band who still perform today. Not sure if ‘Rub Mi Khaki’ is still in the set list. Thanks for listening to and reading these for the last 2 weeks. Kevin starts back up tomorrow. 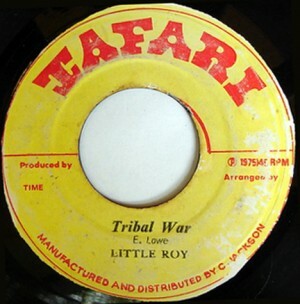 Little Roy hired Lee Perry to produce this 1974 single, about the peace treaty arranged between Kingston’s warring gangs, for Roy’s new Tafari label in Jamaica. The track was recorded and voiced at Perry’s new home studio, the Black Ark. Fueled by the pedal phased guitar of Roy Hamilton, with Pablove Love on keyboards, it also featured singer Dennis Brown playing bass and legendary drummer, Leroy Horsemouth Wallace, rounding out the rhythm section. 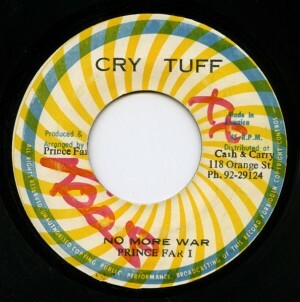 ‘Tribal War’ was a hit and resulted in a number of successful cover versions, including heavily influencing Third World’s album track of the same name. 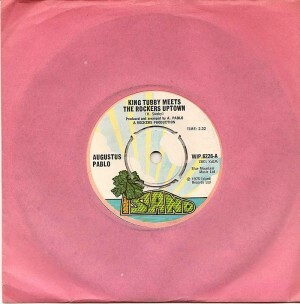 But Little Roy’s understated original is the definitive one. 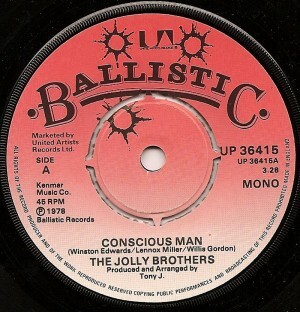 Original pressings are scarce as hens teeth. I found a small scan of one on the web and worked it up to a viewable size as much as possible. Easier to locate is the Pressure Sounds reissue from earlier this century. 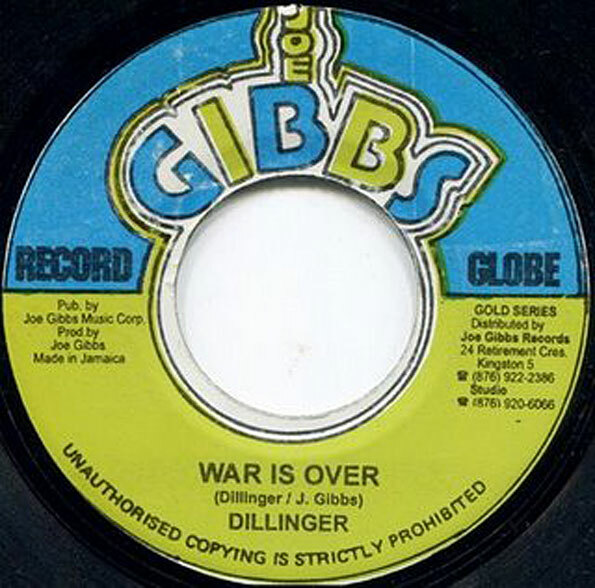 Dillinger’s Joe Gibbs released version, ‘War Is Over’, starts off with a heavy patois laden proclamation, declaring there has been a “Peace treat, so now ya haffa come out and get likkle fresh air…” “Peace treat…” what a great term. And in a nod to Kenny Rogers, he further states “Son, don’t take your guns to town”. 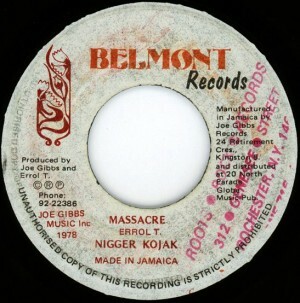 It originally came out on the Joe Gibbs sub-label, Errol T., which featured the productions of resident engineer Errol Thompson. The label shown here is from the Joe Gibbs Gold Label reissue series. Prince Far i’s version, ‘No More War’, directly confronts the warring parties with authority. “So you’re the one who come here to mash up this place, eh? Well, war is over… Natty dread come over.” Atop a low burning and minimalist roots-echo groove, the good Prince gives testament in his own deep voice of conviction. Self-produced & released on his Cry Tuff label in Jamaica. This is a record from the career of Lee ‘Scratch’ Perry. 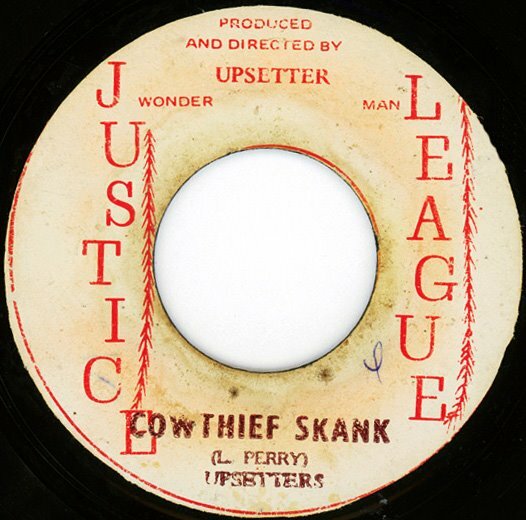 By the late 60′s, Lee Perry’s career had taken him from his ska days as runner and studio assistant with Sir Coxsone Dodd at Studio One, and onto his own with his first self productions. In fact, I believe this is actually his first. 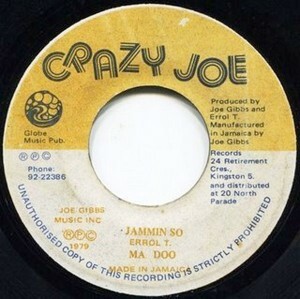 He had become a house engineer for Joe Gibbs and when the rock steady sound became big, Gibbs made Perry the in-house producer for his new Amalgamated label. 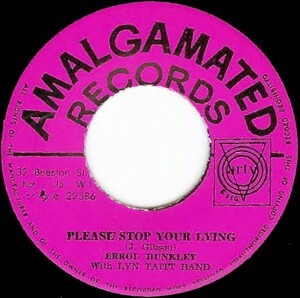 Many of those early Amalgamated rock steady gems were Perry produced, tho he was not credited. 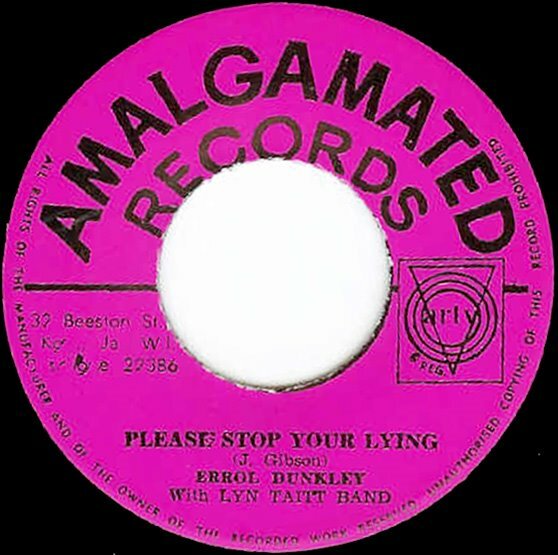 ‘Please Stop Your Lying’ is also the first single for the teen-aged Errol Dunkley who would go on to success in JA & UK thru the 70′s. This track slow-burns from the moment it starts, with great horns, and equally great low note guitar picking. There’s a perfect swing in the band’s playing for Errol to step lightly over. It commands you to the dance-floor and shows that right from the start Perry knew how to set the stage for a great performance to be captured. 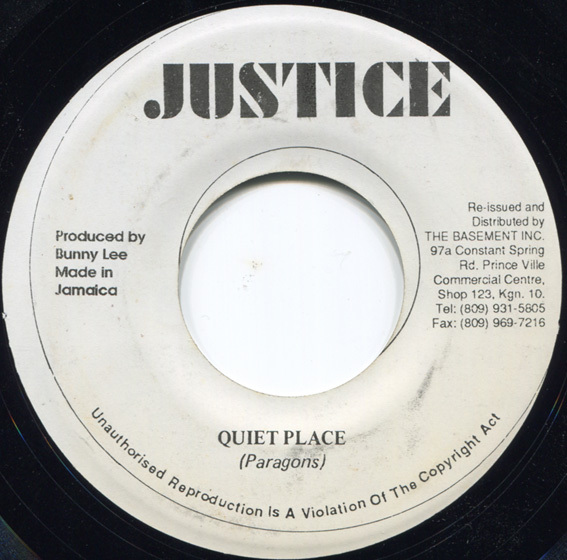 ‘Quiet Place’ is the original name of the oft covered Jamaican fave – ‘Man Next Door’. Same song, it just acquired a different name over the years. 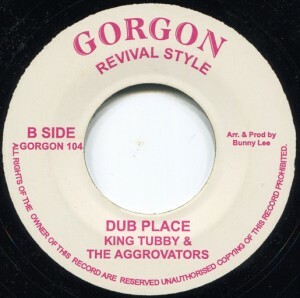 This is the original version by The Paragons, who came from the late rock steady period, into early reggae with tight pop harmonies like those showcased on this mid-70s track. The late ’70s roots era cover of ‘Man Next Door’ by Horace Andy is probably the best known remake, tho Dennis Brown had a famous version too. 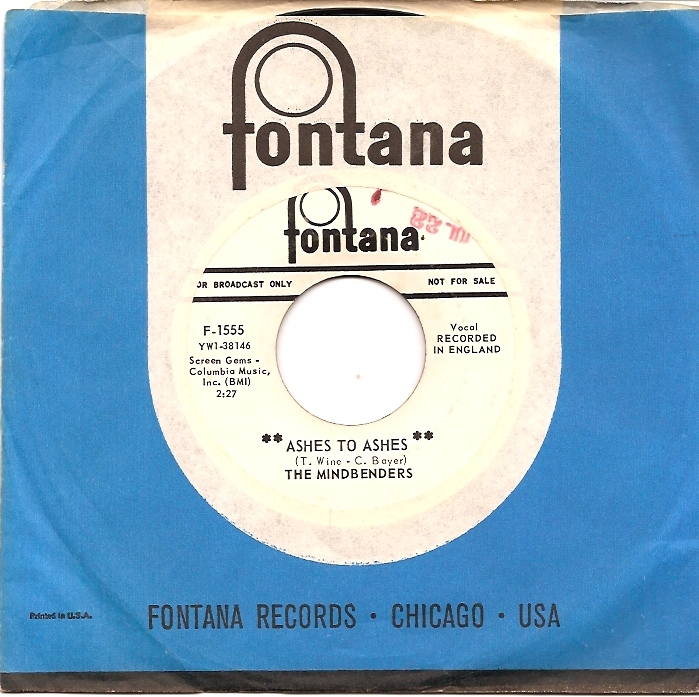 An interesting side note for Rochester readers of this blog, The Paragons original version 7″, plus DJ mixes with I Roy & others, were released in this country on the Andy’s label from the Bronx. In the aftermath of the riots & fires of the Bronx in ’77, Andy left the Bronx & moved his record store to Rochester. 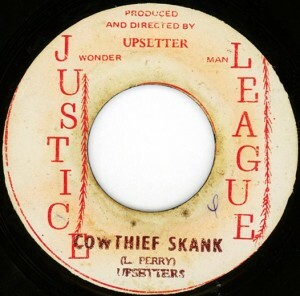 Many of us old timers up there got our 1st Jamaican records from Andy. 3 great tracks – All Killer, No Filler! Joe Higgs was a seminal artist from the early days of ska, thru the heady days of Rastafarian reggae into the 80s, and a popular singer up until his death in late 1999. He had early hits with Roy Wilson under the duo name of Higgs & Wilson in the ska days, taught a young Bob Marley how to sing, and became a member of the Wailers during their 1st tour of America when Bunny Wailer got arrested for ganja possession just before they left. 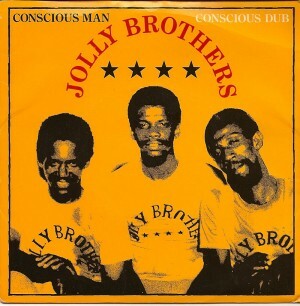 His mid ’70s album, LIFE OF CONTRADICTION, is one of the 10 essential reggae albums any collection needs. 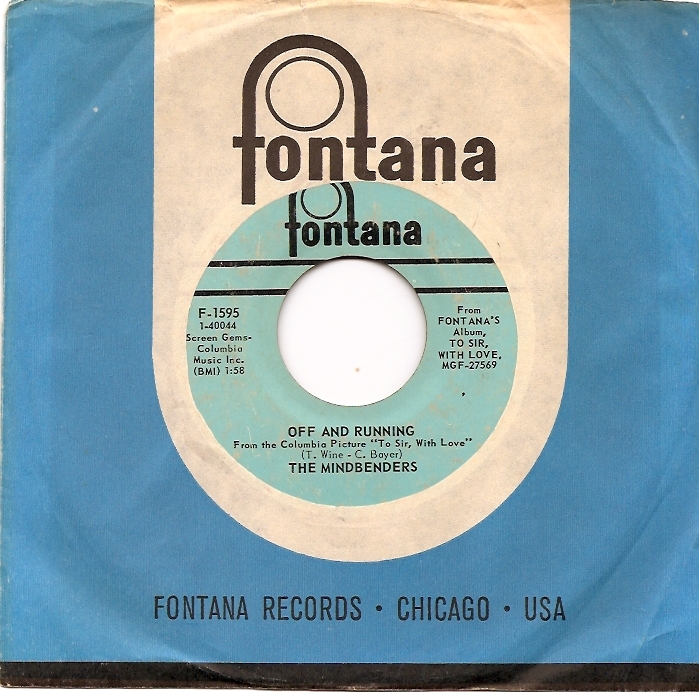 It set a unique standard for song writing & production, featuring the intricate guitar work of a visiting Eric Gale, from America. With a voice that made the ladies swoon, every track on that album was a winner. It was released on Micron in JA and, in a slightly altered & muddier version, on Grounation in the UK which was the version reissued on CD by Pressure Sounds a few years ago. 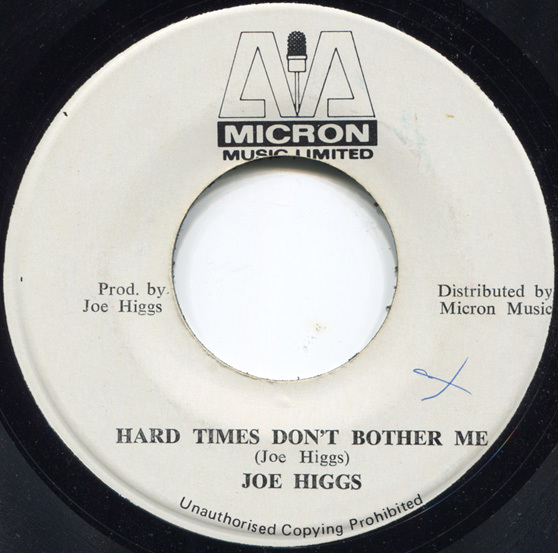 ‘Hard Times Don’t Bother Me’ is from that album, which also included an updated version of ‘There’s A Reward’, his early ’60s Higgs & Wilson ska hit. King Stitt is the oldest living Jamaican DJ today, having begun in the late ’50s deejaying on Coxsone Dodd’s Downbeat Sound System. His break came when he was given a chance on stage by Coxsone’s reigning DJ, the legendary Count Machuki. Back then, the sound systems only ran one turntable so the DJ would fill the moment of silence between tracks with public service announcements and other patter, etc. As time went by, the competitive nature of the DJ’s meant they got more original and humorous as they began rhyming and clowning around. This led to them talking over the records, which led to singles coming out with instrumental versions on their Â B sides in the hopes that it would seduce the DJ to play it so he could toast over it. Stitt had his own style of delivery, as well as a distinctly memorable voice. Facially deformed at birth, he took his nickname “The Ugly One” from the popular movie of the day THE GOOD,THE BAD AND THE UGLY. 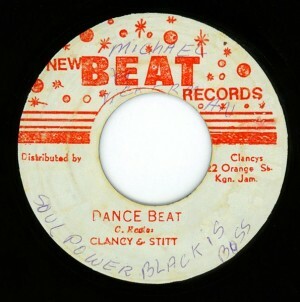 He had Clancy Eccles produced hits with ‘Herbsman Shuffle’, ‘Vigarton’ and the track featured here – ‘Dance Beat’. In it, he recalls the days of the great dance clashes at Forrestors Hall and other places, name checking Machuki as he remenices in a back and forth with Clancy. 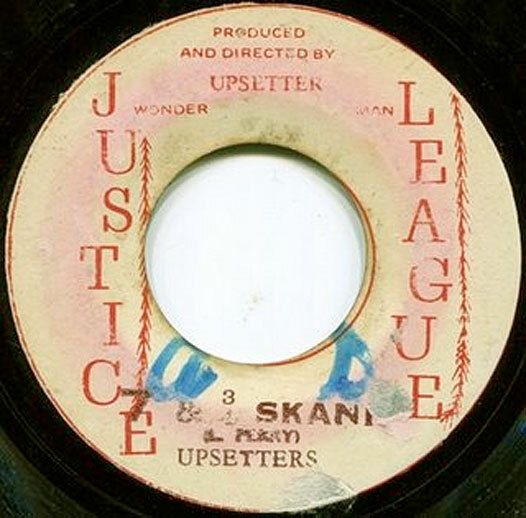 The Wailers got their start with Coxsone Dodd at Studio One in the early 60′s, singing doo wop and RnB covers, along with songs written in the new ska style. They had a good bit of success but it was a problematic relationship. 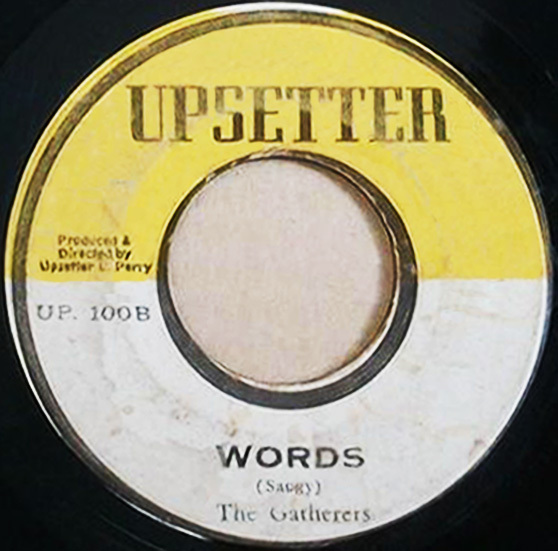 In the 60′s, blacks around the world began to embrace their African heritage, and for The Wailers this led to the beginnings of their Rastafarian beliefs. 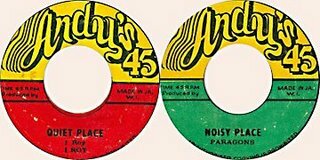 Dodd was not a Rasta and, like Duke Reid over at the other big label, Treasure Isle, he didn’t allow Rasta themes in his records. 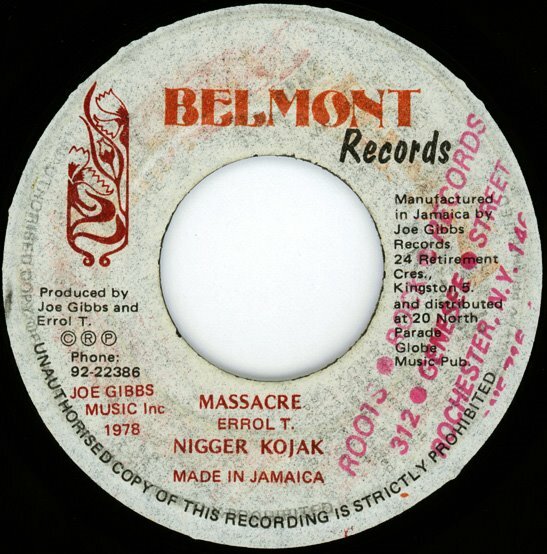 Also, the financial benefits of their hits never fully came their way, as is so often the case in the Jamaican music industry. Despite a successful ska career, and having a handful of hits, by the mid 60′s, Bob Marley was essentially homeless and sleeping in a back room at Studio One. It was then that he decided to go to America, to live with his mother for a while and make some money, before returning to Jamaica to fund the next phase of the band. After a stint in Delaware, working the night shift in an automobile factory, Bob had saved some money. But it was the American military’s decision to begin drafting young men to go to Viet Nam that made him decide it was time to return to Jamaica. 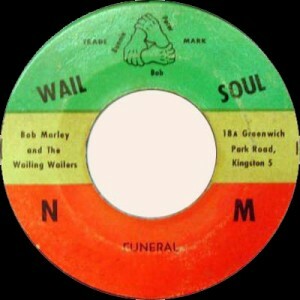 On his return he reunited with The Wailers, Bunny Wailer and Peter Tosh, to form their own record label and they called it Wail N Soul M. Its logo illustrated their three arms interlocking in unity. They set up a little record shop across the street from a cemetary, and used to go to the funerals there. Just to go to them… don’t ask me why. 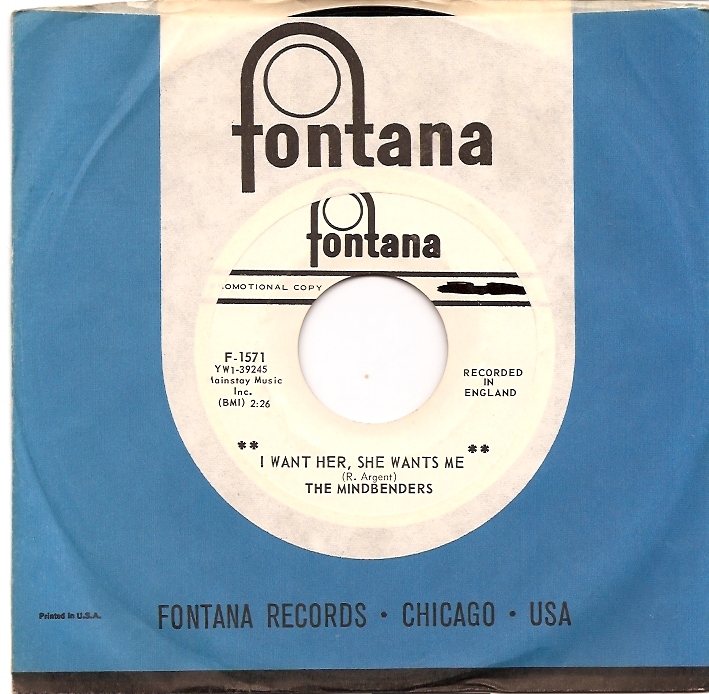 Maybe that’s where the inspiration for the B side of this early single came from. The A side, ‘Pound Get A Blow’, was the story of global currency troubles and the way they ripple thru a society. 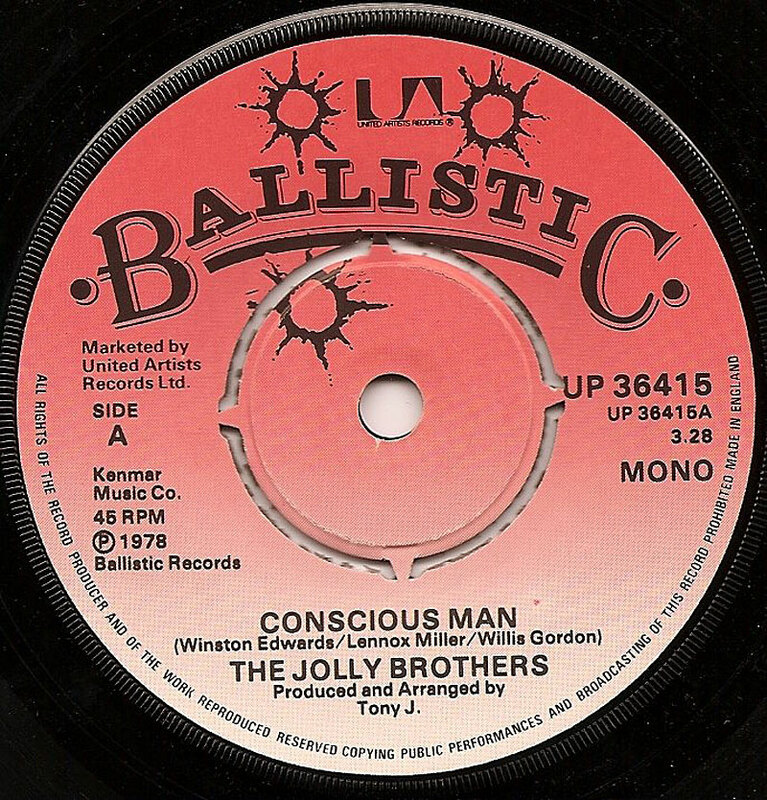 Bob and Peter trade lead vocals on this, and at one point, Bob really croons. 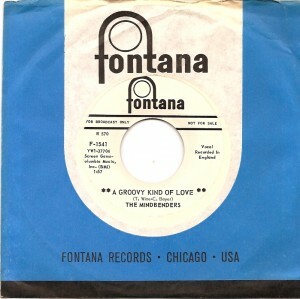 Peter sings lead on the B side, ‘Funeral’, with Bob’s new wife Rita singing backup. The band included JA session masters such as Dizzy Moore and Tommy McCook on horns, Hugh Malcolm on drums and Jackie Jackson on bass. Both tracks were recorded at in late ’67 at West Indies Studios, and self produced by The Wailers. To my ears they more than stand the test of time. Two labels are shown here and they help illustrate the path a Jamaican single normally took. The first pressing would be a white label, with info either rubber stamped on it or hand written. 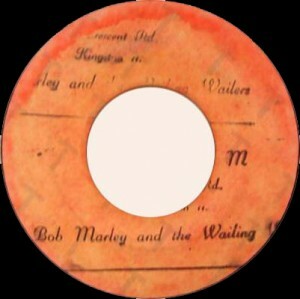 These small quantity pressings were sold to the many DJ’s for sound system use. 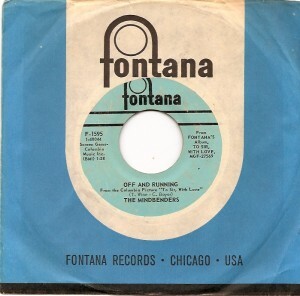 Then, if the record was popular enough at the dances to be worth a retail release, they would invest in printing real labels for the formal pressing. Owen Gray is one of those guys who lived thru the greatest period of Jamaican music. 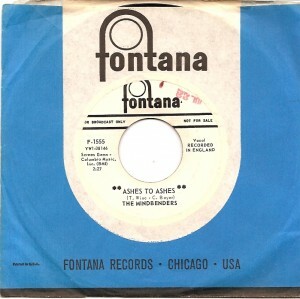 A graduate of the famous Alpha Boys School, whose music program made superstars out of so many street urchin kids, he started out in the big band R&B days of the late 50′s, made the graceful transition to ska without losing any of his heat, and continued to put out records thru the 60′s, 70′s, & 80′s. He moved over to gospel and more easy listening type stuff as he got older, but these early gems still hold the ability to tingle the ears. I first heard of him on a home made cassette that the infamous Lucky Gordon (of the UK Profumo scandal in the 60′s fame) recorded for Corinne back in the early 90′s. That’s a story in itself. 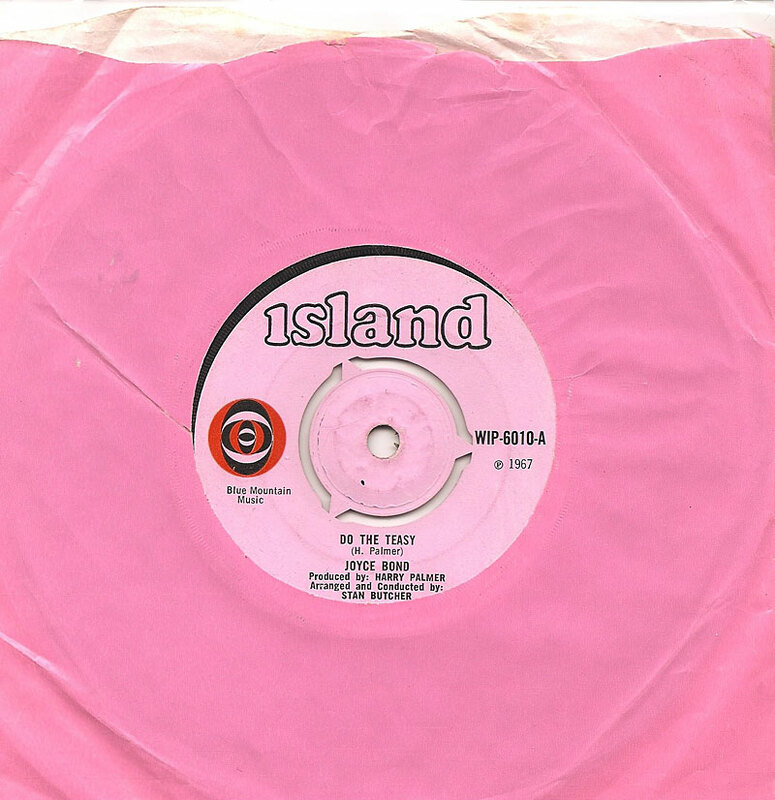 ‘On The Beach’ was the Owen Gray track that hit me first, and it set off an instant search that lasted for several years before I could locate even a scratchy copy with its label scrubbed off. He did some early RnB singles with Prince Buster at the helm, and this one is a fave. Man oh man, what a good looking record label… silver on black. ‘Millie Girl’ features that slow tugging Louisiana RnB shuffle rhythm that formed a perfect bed for a Jamaican vocal. You can hear the seeds of reggae in it. This was the beat that would speed up a few years later and introduce the world to ska. 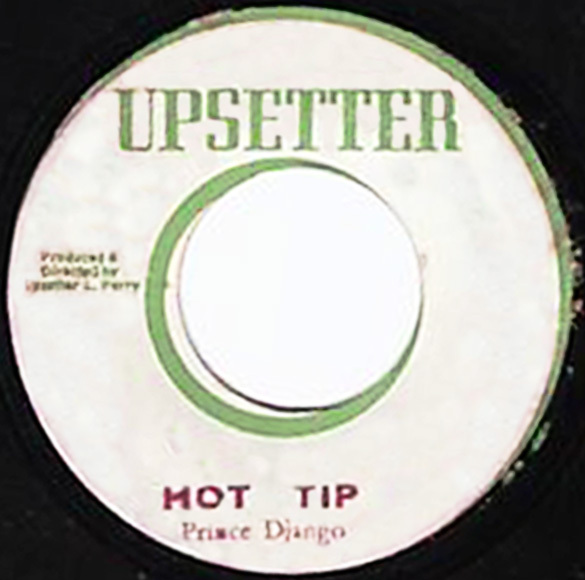 One of the most fun things about collecting reggae singles for the last fifteen years, has been how scant the information about many of these recordings is. That some records even exist is sometimes surprising. 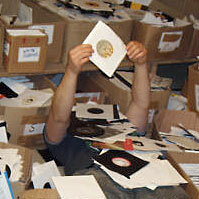 It didnt help that often the completely wrong label was applied at the pressing plant. And there was also very little formality in the record keeping depts of most JA labels, which is probably what helped keep so many artists from ever seeing any of the money their releases made. So it’s much more of a detective game, collecting this stuff, than rock records. 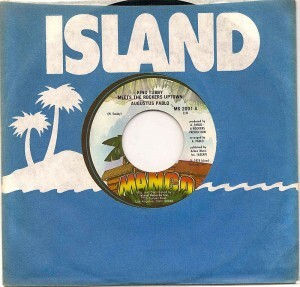 Unlike rock, there were very few discographies on reggae around until just recently with the web. Before that, you would buy home made bootleg cassettes on the street & scour them for good things to then seek out on vinyl. 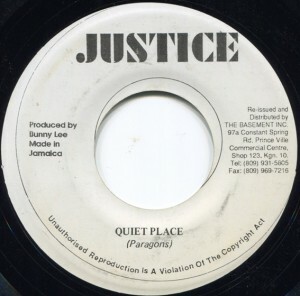 And to find the few discographies that existed, you would have to hunt & buy them in little 4th generation xeroxed booklets from the few reggae shops that were around, or order them thru the mail. So I don’t know much about this single, except how much I like it. The little info available seems to suggest it was recorded in the late 60s, but who knows if it was released at that time? 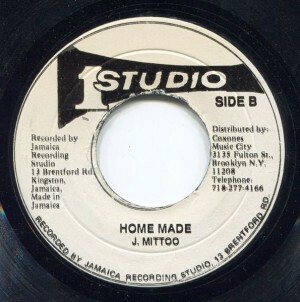 Coxsone Dodd’s Studio One was home to Jackie Mittoo for most of his career. He was a session keyboard player on most of what passed thru those doors until ’68 when he moved to Toronto, tho he still returned for session work. 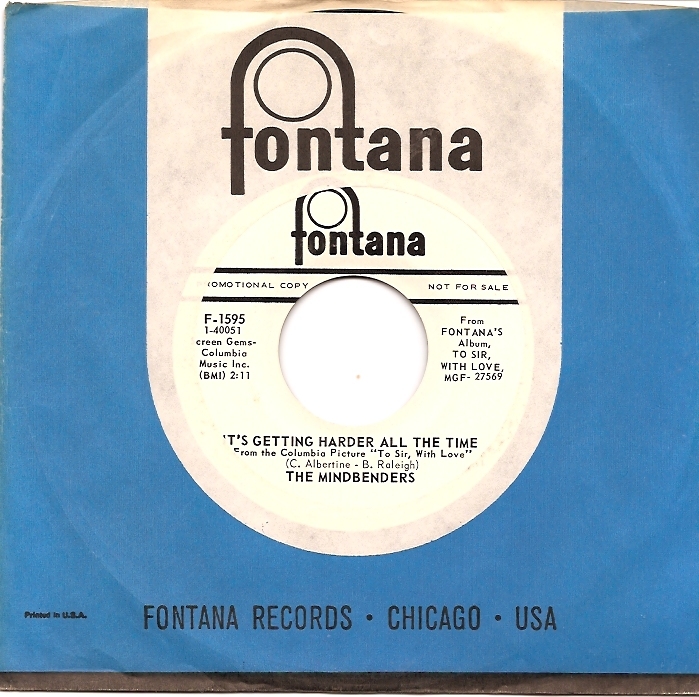 The band behind Jackie is The Soul Vendors. He was a member of all of Studio One’s legendary house session bands in the ’60s, not just The Soul Vendors, but The Skatelites, The Soul Brothers, and The Sound Dimension. 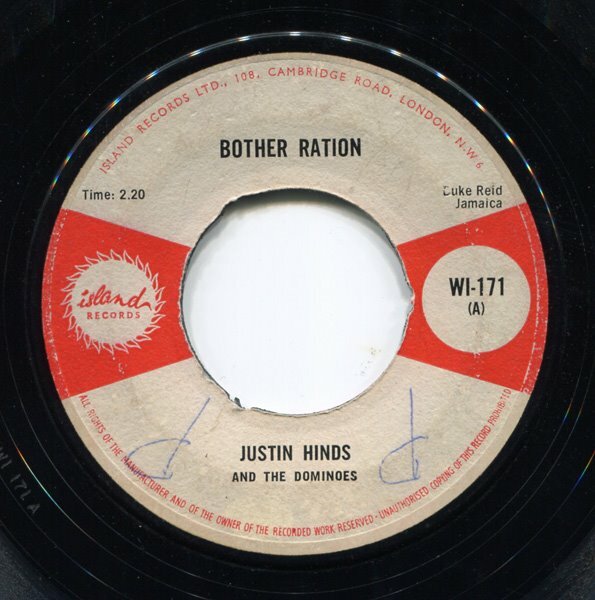 ‘Home Made’ is an instrumental that can also function a bit as a resume of hits he’d played on for Coxsone. In it, he circles around riffs from the Wailers “Rudie”, and The Maytals “Bam Bam”, among others. Sounds like it was recorded live in the studio, as many hits were back then. 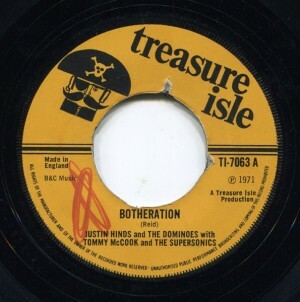 Original pressings of this kind of thing are next to impossible to run across, even on ebay. If you see one, you may be seeing it for the first & last time in your life. Often when reissued, a Studio One single will have a different b-side. 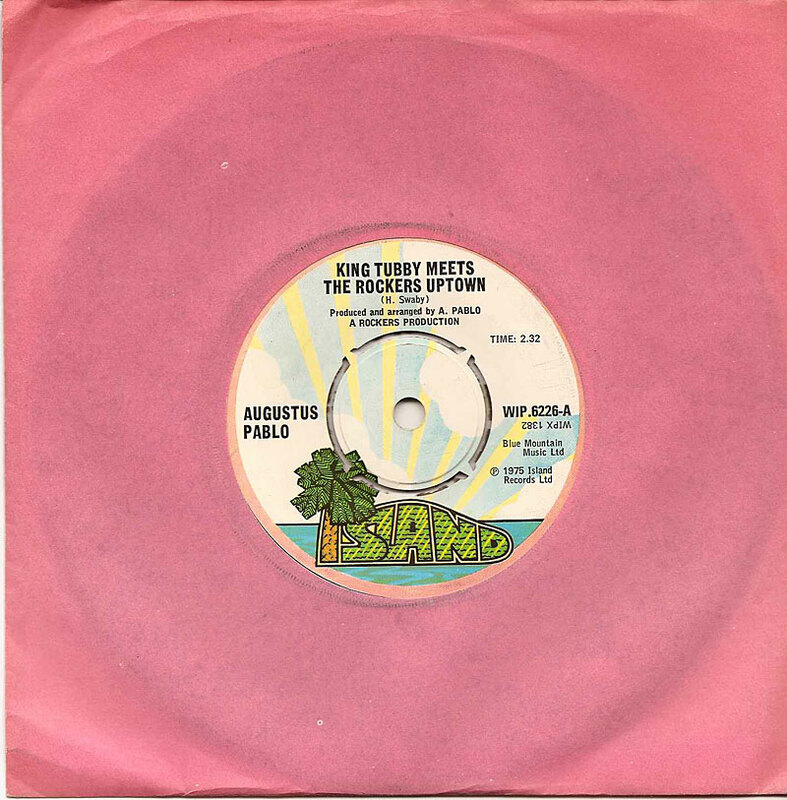 I looked this one up & its only ever listed by this matrix & with this b-side (The Ethiopians – “I’m Gonna Take Over”) so it may be an original. I really have no idea. 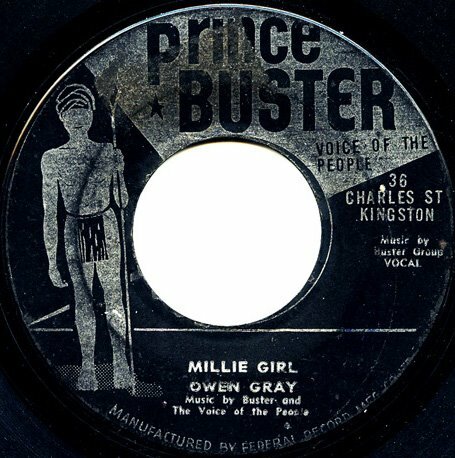 There is more to say about Cecil Bustamente Campbell, aka Prince Buster, than there is time to write about him. 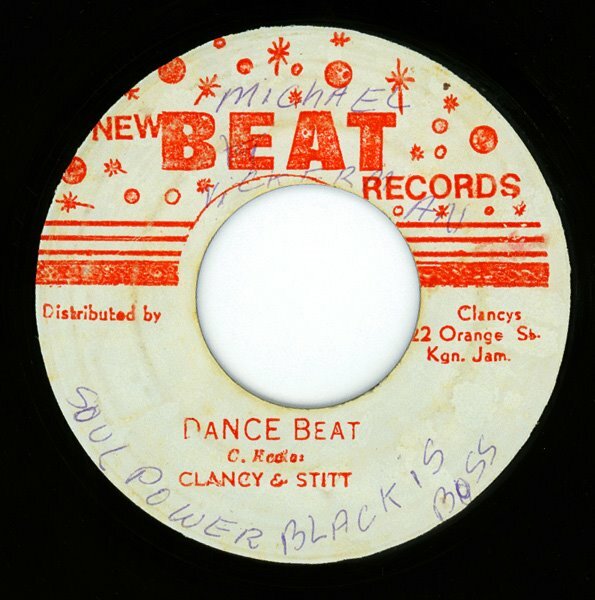 His influence on the history of Jamaican pop music is undeniable. He was the first to bring a Nyabinghi Rasta drum troop (Count Ossie & The Wariekas) down from the hills & into the studio to provide African percussion on his debut single production, ‘Oh Carolina’ / ‘Chubby’ for the Folkes Brothers in 1960. He went on to be at the forefront of the music scene when Jamaica gained her independence in 1962, and the country took as its musical signature, a shuffle rhythm & blues beat heard on the radio from New Orleans. They sped it up & created ska. His biggest hit was ‘Ten Commandments From Man To Woman’ in ’67, which was even a minor hit here in the USA. He continued making & releasing music into the ’70s, and still plays the odd one off gig today. (‘tho he stiffed the sold-out NYC crowd I was part of in the late ’90s, by coming into town but then not showing up at the club). While I think I recall hearing the ‘Ten Commandments’ on Top 40 radio in the 60′s, and heard him memorialized by The Specials & Madness in the late ’70s ska revival days, I didn’t really get turned on to Prince Buster until the early ’90s. I was junk shopping on Canal St in NYC. An old Jamaican junk dealer had a little cassette player on his table & was playing a home made tape of his fave Prince Buster songs. My ear kept getting drawn to the tape player as I poked around his stuff, & so I asked him who it was. Minutes later, I’d talked him into selling me the tape. No song credits, nothing written on it but “Prince Buster Mix” in ballpoint blue. One song stood out for its smooth vocals, fantastic drum sound, and the uncommon addition of a violin. I don’t think I’ve ever heard a violin in reggae since. I went on a mission to find out what that song was. Only about half of it was on the tape. Some years later I was on a video shoot in Tennessee, where a hurricane had turned our location into a rainy swamp. As a result we had the day off, so we went into the little town to poke around. 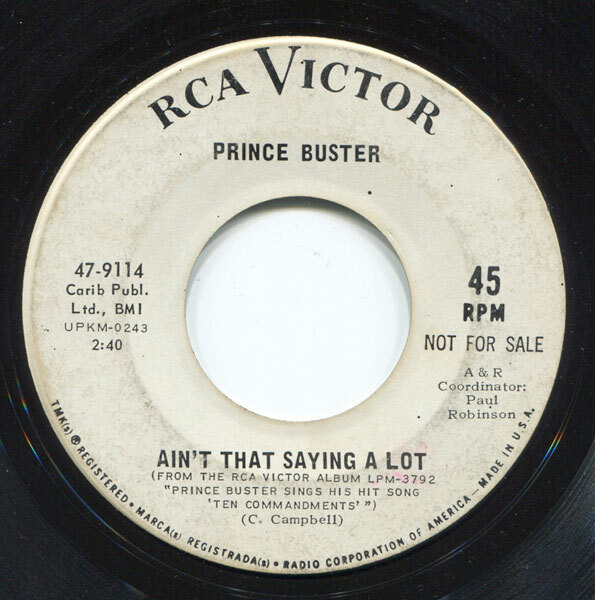 I found a mint copy of Prince Buster’s TEN COMMANDMENTS LP for $6.00 in a little thrift store. When I got back to Brooklyn & played it, there was my unnamed song – ‘Aint That Saying a Lot’. 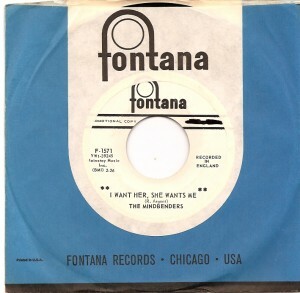 A few years later I was in a garage sale with Kevin when I found a white label 7″ of his followup single, ‘Ten Commandments From Woman To Man’. Flipping it over I was delighted to find that my fave track had made it to a B side. 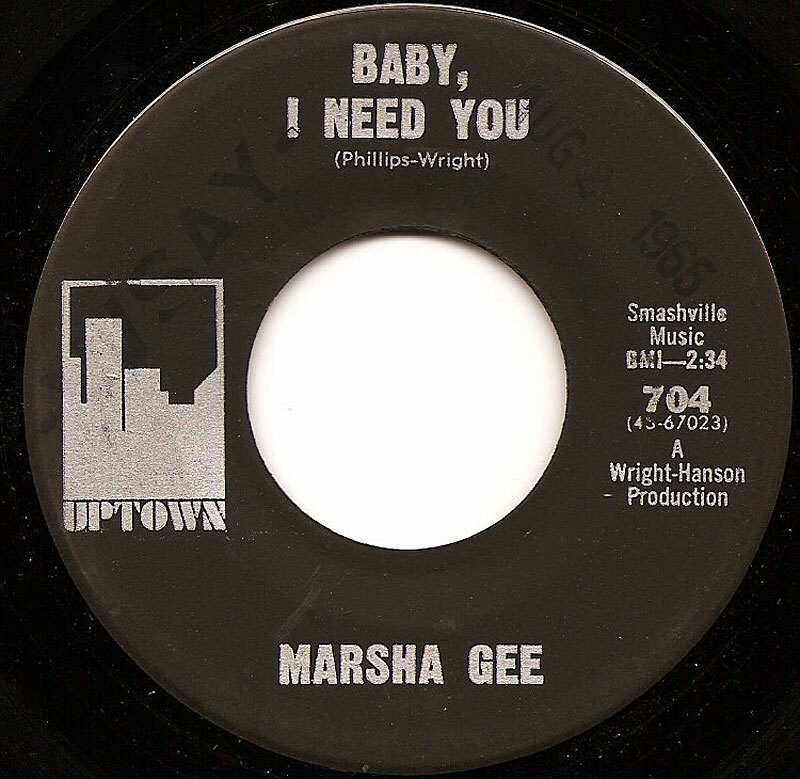 I know very little about Marsha Gee. Actually, I know nothing about her. I got this record from a radio station PD in ’79. The said station, WSAY, had an extensive record library that was simply off limits to everyone but employees from the ’60′s onwards. When the original owner decided to sell and leave the staff high and dry, that music director decided to take care of a few of the nice promotion people he had dealt with over the years. 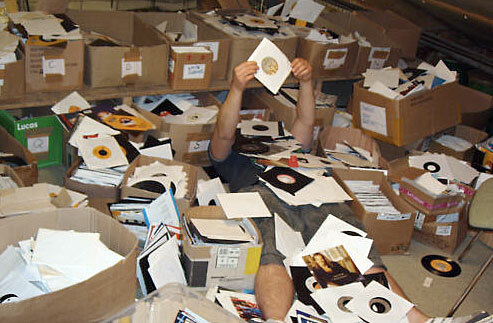 Luckily I was one and he brought round two huge burlap bags full of 7″ singles to my place one spring day. It was a selection never to forget. And this record by Marsha Gee was one of them. 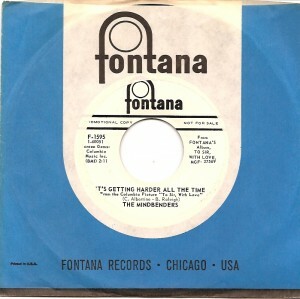 I always loved it, little did I know it was Northern Soul waiting to be. To be honest, I truly always had a hunch it was valuable and now, if and when it goes up for sale, the ticket clocks in around $300. But as Duane has told me many times, that doesn’t mean any money in the bank for me. You see, I can’t part with a thing, making all this stuff basically worthles until I croak of course, which I have no plans on doing for another hundred years.